Both sexes: Blackish-grey with white bill and frontal shield. 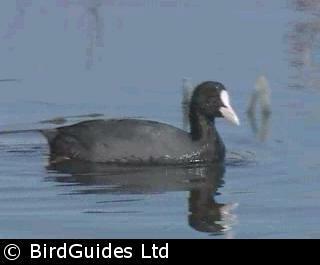 The Coot is plump with a short tail and is similar to the smaller Moorhen, which has a red bill and shield. 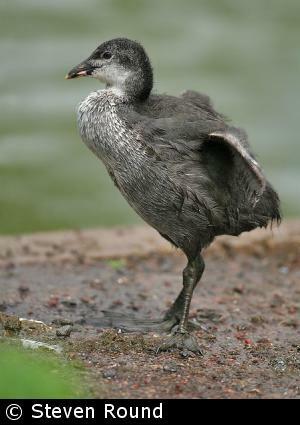 The Coot's plumage is sooty-grey, and its bill and frontal shield are white, though the bill can sometimes have a pink or yellow tinge to it. The legs and lobed toes are silvery-grey, but the sides of the legs are yellow-green, and just above the "knee" (really the ankle joint) is an orange-red "garter". Juveniles are more grey-brown and have a whitish face and throat. Nestlings are black and downy with a reddish-orange head and neck with a ruff of yellow feathers around the neck. 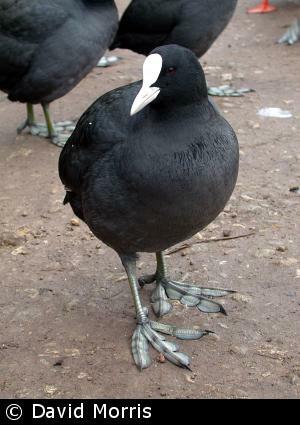 The Coot has a large repertoire of calls, but one of the most common is a surprisingly loud metallic "cut". Coots feed on aquatic plants, like duckweed and grasses, and animals such as snails and larvae brought up from the bottom of the pond or river. When they venture into gardens they will feed on kitchen scraps and soft seed. 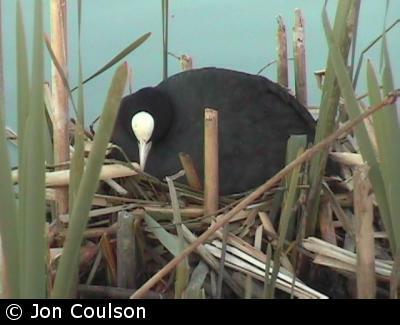 The nest is built in shallow water from vegetation, and usually in the shelter of vegetation but can be in the open. During the breeding season, vicious territorial fights can occur. The Coots eggs are smooth and glossy, buff with dark brown spots. They are about 53 mm by 36 mm. Both parents incubate the eggs and look after the precocial nestlings, which when newly hatched are led to the water by their father. A few British birds will leave Britain in the winter for a warmer climate, but most stay and form quite large flocks at large reservoirs and gravel pits. These flocks are added to by birds from Scandinavia, especially around the southern coast, and the winter population can then be up to half a million birds. The population has thrived with the increasing number of gravel pits, flashes and reservoirs.